It's big. It's huge. And it's Christmas. Get ready America because the Santa Claw is back. 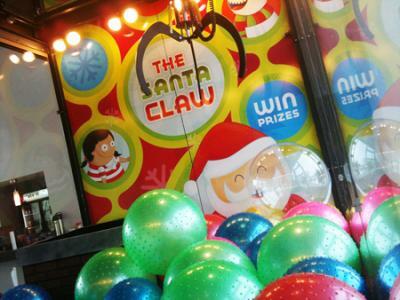 The Santa Claw is the world's largest remote control claw game played online. How did this gem slip under my radar last year? Well, most likely because I was devouring cookies (thanks Mom!) and watching Christmas movies. Real Art Design Group, a design company based out of Dayton, Ohio, let one of their outrageous ideas, and many children's dreams, become a reality in 2011. Equipped with 2,000 pounds of steel, 700 feet of wire, three electric wheelchairs, an Arduino Mega, five refrigerator switches, four cameras, three motor controllers, two power supplies, an actuator, an ultrasonic sensor, and a partridge in a pear tree, Real Art was almost ready to launch. After several hours of constructing the claw, their crew had to program the machine, set up webcams to watch the 17-feet by 8-feet by12-feet game, and of course, fill it with prizes. Now that the Santa Claw was completed, it was time to find a location and unveil their stroke of genius. Locating the claw in the showroom of their headquarters allowed the team to monitor everything in real time. With blogs such as Mashable and Laughing Squid, featuring The Santa Claw on their sites, the word spread rapidly. On the sites first day alone they had 20,000 visitors check in and play, compared to the 500 visitors that Chatroulette saw on their launch. The responses were overwhelming and since then 300,000 visitors, even as far away as Africa, have clicked to play and win. Last year's prizes included anything from a Snuggie to leather chaps, but this year Real Art teamed up with Gizmodo and moved locations to the Gizmodo Gallery in NYC. Online players have the chance to win online prizes including tablets, cell phones and even a Roku box while gallery players can grab Gizmodo T-shirts, Buckyballs, and two tickets to the American Museum of Natural History. Online winners must submit their contact information then wait for prizes to be mailed to them. To humor those who don't win, take a quick video of your 'unboxing' and post it up on YouTube so we can all share in the joy of your winnings and covet over them too. You can login to The Santa Claw with your Facebook and Twitter and create a user name. You don't have Facebook or Twitter? (I'm not judging you—don't worry.) Then simply use your email address to login and play. What else could be better than playing a free online version of the claw and actually winning awesome prizes? Customizable avatars, of course! While waiting in a virtual line, and believe me, you WILL wait, you can choose your avatar and dress them up to fit your personality. The line does have a maximum limit and you can see the number fluctuate to give you hope that you are one person closer to playing. They have also limited when you are allowed to play and created a time frame of 11a.m. to 11p.m. and are only passing out prizes between December 5 and December 11. Not yet having the chance to play, and even getting bumped out of line due to a faulty internet connect at home, I am becoming more anxious and obsessed with the game, the huge metal claw, and one awesome prize. Maybe I want to redeem myself after many childhood years of letting the prize slip through the claw or perhaps I want to see if it really is as cool as everyone claims. Either way I will continue to wait in line, with only 847 people in front of me, for my chance to play (and win) before they stop handing out prizes and the Santa Claw is shipped back to the North Pole until next year.